Today, Microsoft finds itself in a curious predicament -- The Company is in search of a new CEO even as it remains in the midst of an organization-wide reorganization towards a "devices & services" strategy. While I will refrain from speculating on the identity of this mystery CEO, it would seem that his job will be to effectively execute this strategy, instead of undertaking a strategic review. This may seem like a handicap, but is there more than just one way to execute this strategy. Well, certainly we shouldn't look at hardware as a source of write-off, so let's not use the last order as a proxy for performance. I think the right way to think about this is -- or the way we think about it is kind of an integrated business model. There's the device, the operating system, the back-end consumer services, and the extensibility of those -- of that offering into enterprise services. And across that entire range, from hardware to, quote, operating system, because in the PC world we participate through our operating system royalty as opposed to through the direct hardware economics like we participate with Xbox. You know, when we bought Skype we were quite clear that a lot of the economic value from Skype would be from Skype and Lync connection and the ability to move people between the consumer and enterprise world and monetize in the enterprise. So I don't think you could draw a line and say we think about the economics as A or B. And certainly the guys we compete with all have different models. Apple is trying to make a lot of money on the device. Amazon is trying to make it all on the back-end. So is Google. Rather than say the model is FOO or BAR, the model is to deliver these incredible, high value experiences that will span hardware innovation, operating system, consumer experiences and enterprise experiences, and then properly monetize them, because we are a company -- unlike some of the guys in this industry, we do make a lot of money, and we want to continue to deliver a lot of good results for our shareholders. And that's not an easy way, it's nice to be able to just bucketize things, but I think that's the smart, competitive, proper way to think about it. Essentially, Steve Ballmer's opinion is that a "devices & services" strategy would mean that Microsoft would create and profit from their own devices & services. This is also the most simplistic view of this strategy and the one least likely to succeed. The way to understand this is to view an organization as a set of resources, processes & priorities. Resources refer to human capital, infrastructure, cash, etc. while processes & priorities refer to methods in which decisions are made in an organization. Processes & priorities tend to be difficult to change as they are built over time based on the business model that helped the organization succeed. Therefore, executing a business model shift is extremely challenging. We need to keep this in mind for the following paragraph. The best way to profit from a services strategy is to reach the widest possible audience (Google's strategy) and the best way to profit from a devices strategy is to use exclusive services to retain the loyalty of your customer base (Apple's strategy). Therefore, the processes & priorities specific to each business model are unique. A simplistic "devices & services" model ensures that newly established processes & priorities, even if they replace previous ones, remain in continual conflict. Also, this "integrated business model" exposes the company to asymmetric competitors in both device & service markets. As I explained above, there are two possibilities to craft an asymmetric "devices & services" strategy. One way is for Microsoft to use its devices as a cost center to help monetize services -- This strategy would only work for services like Bing, Skype, etc., as premium offerings like Office are unlikely to appeal to mass market customers. The challenge here is twofold -- 1) To create a viable ecosystem to attract customers and, 2) To ensure that Microsoft's processes & priorities are effectively transitioned to this new business model. Rumors of the forked Android Nokia handset, and a possible purchase of a third party appstore, could go some way in accelerating the process of creating a basic ecosystem (an easy way to enter a large market like China). However, it is extremely difficult for any organization to change established processes & priorities even though it is required for any business model shift. The second way is for Microsoft to use its premium services as a moat to attract and retain customers to monetize hardware. 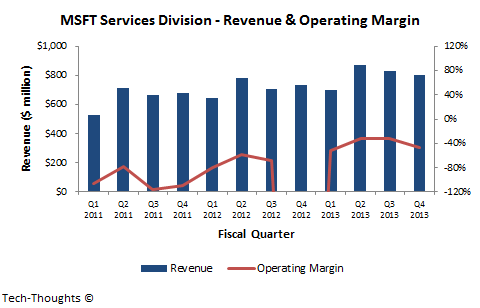 In this case, Microsoft's services business (including Office) need to transition from a profit center to a cost center. In addition to what I highlighted above, this strategy carries even more risks. First, the entry barrier to create a viable ecosystem is even higher for premium customers (a "forked Android variant" would certainly not be enough). Second, Microsoft faces competition from cheaper, "good enough" products that also have access to a superior ecosystem. Essentially, there is no easy way for Microsoft to transition to a "devices & services" business model. But there are a few paths that could either give them a fighting chance or seal their fate.